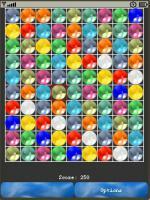 Ball Bruster is a fun and entertaining game that will keep you interested for hours on end. In this game, you swipe and spin ball to make right match and must gather ball by packs of 3 of the same kind (vertically or horizontally) to make these explode. Try to chain explosions and make combos to get more points.